THE CONCEPT IS SIMPLE: locate the spot directly across the planet from you, find someone there, and then both place a piece of bread down on the ground, sandwiching the world. It’s the execution that’s difficult. A little investigation quickly told me what my recollections of elementary school geography did not: my exact opposite is in the Indian Ocean, southeast of Madagascar. Without the aid of a very earnest seaman, this was going to prove an unlikely effort. The earth sandwich was created by Ze Frank, a man whose blog is a clutter of ideas that invite action and collaboration. Frank believes that an act of heroism, even silly heroism, can elevate. and what could be more heroically silly than turning this whole mess of a world into cosmic, symbolic lunch? “The fact that the earth has never been a sandwich,” says Frank, “is probably why everything is so fucked up.” Surely there are other reasons. But symbols are powerful, and there is a messy charm in Frank’s thought processes that is found in many great sandwiches. 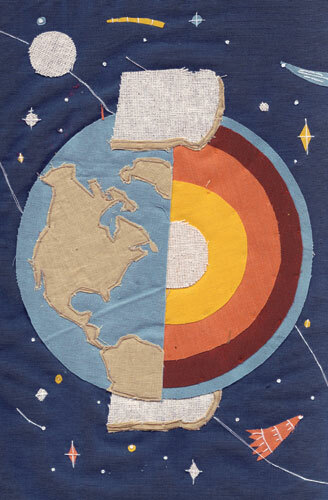 So far, there have been only a few completed earth sandwiches, due to complications of politics as well as geography. The first was a diplomatic collaboration between Spain and Australia. One Fijian attempted to complete his sandwich by contacting an embassy in Mali. He was told that certainly it could be done, but it would cost him. MARISSA GUGGIANA is the author of Primal Cuts: Cooking with America’s Best Butchers. She has recently established the Butcher’s Guild, in support of a meat industry with integrity and fraternity. EMILY L. EIBEL works as an artist and illustrator in Brooklyn, New York, but hails from Ohio. Her work has been exhibited across the United States and internationally. Visit her website at emilyeibel.com.